Effectiveness and Efficiency – there is still a bit of confusion about this pair of terms. Sometimes, they are used interchangeably. The distinction seems to be a bit blurring. I guess one part of the problem is that these terms sound fairly similar. Another reason is that effectiveness and efficiency often come together in a common context. An activity may be effective and efficient, effective or efficient, or neither of the two. You work effectively, if your activities lead to the desired outcome. You work efficiently, if you realize the desired outcome at minimal cost or effort. Efficiency and effectiveness are both terms used to assess a particular measure or activity in terms of achievement of objectives. The first one is concerned about the right direction. The latter one is about the relation of expense to benefit. Alternatives 2 and 3 are effective. They lead to the target. Alternative 3 leads to the target too. However, it is not an efficient way to get there. Alternative 1 is a short and efficient way. It does not, however, lead to the target. It is a waste of effort anyway. Alternative 4 is even worse, since it neither reaches the target nor does it at minimum effort. Key questions What?Does this measure bring us closer to our goal?Are we doing the things that bring us forward to our goal? How?Is this measure the one that leads to our objective with the least effort?Are we doing things the right way? Priorities Doing the wrong things efficiently does not lead to target achievement. It is a waste of effort and resourcesDoing the right things is the primary condition Doing the right things inefficiently leads to target achievement.Doing things right is a secondary condition.It is not, however, a necessary of sufficient condition for effectiveness. Is there a conflict of objectives between effectiveness and efficiency? As mentioned above, effectiveness should have first priority, since efficiency without effectiveness is a waste of resources. Nevertheless, effectiveness as a secondary condition is important too. What measures are suitable to achieve an objective? How do we do it really well? How to optimize resource utilization and expenses? Are there any conflicts of objectives? How does a further increase in efficiency impact effectiveness? Is it possible to increase efficiency without compromising effectiveness? Is it possible to increase effectiveness without compromising efficiency? Can we still achieve our target if we abstain from maximum effectiveness? How much efficiency (i.e. 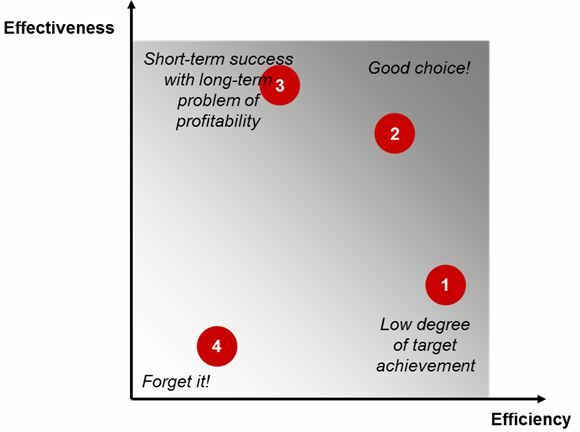 higher costs) are we willing to trade for optimal target achievement? Here we have the same four measures as in figure 2. Measures 2 and 3 both lead to the desired target. They both are worth exploring, although they come at different cost. Further thinking is needed to decide, which of these two alternatives is best suitable for the particular task. In this decision situation it is advisable to define the objective as precisely as possible. Which features of the objective are absolutely necessary and which are optional? What exactly do we want to achieve. 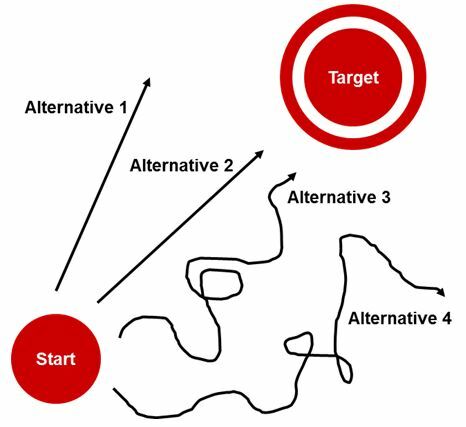 Some shifts in target priorities may lead to a different assessment of each alternative’s effectiveness. Clearly, option B is most effective and efficient. 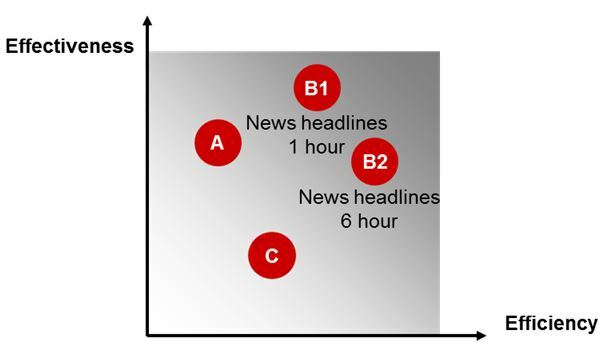 The project team analyzes this option in more detail and realizes that efficiency could be increased further by updating the news headlines only every 6 hours instead of every hour. This, however, would diminish effectiveness. On the first sight, all three alternatives seem to lead to similar success, although at very different cost. A survey form on the homepage seems to be the most sensible approach since it is by far more cost-efficient than the other options. In a second step, the management team defines the objective in more detail. The company heavily relies on its relationships to existing customers and wants to consolidate these relationships. 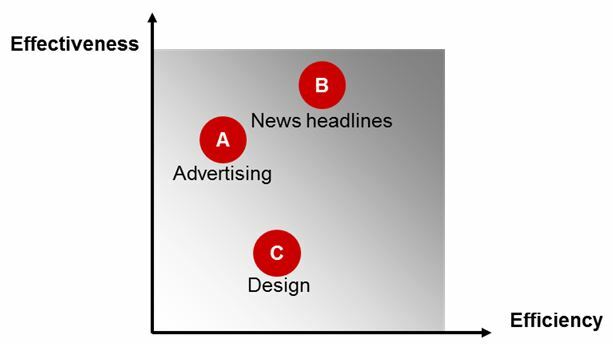 Therefor it is vital for them to learn how their existing customers think about their products’ features. 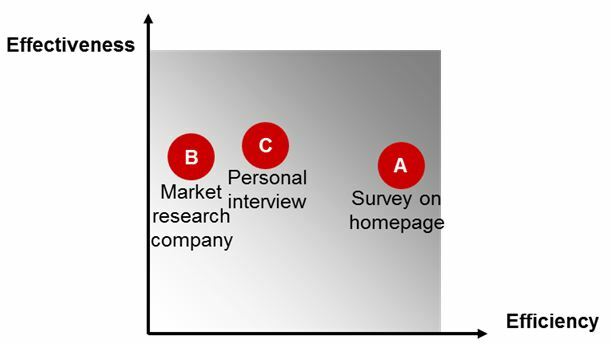 A survey form on the homepage would reach only a small fraction of their customer base, due to the intense personal contact with the sales reps.
A market research company would counteract the strong personal relationships, which the company sees as an asset. 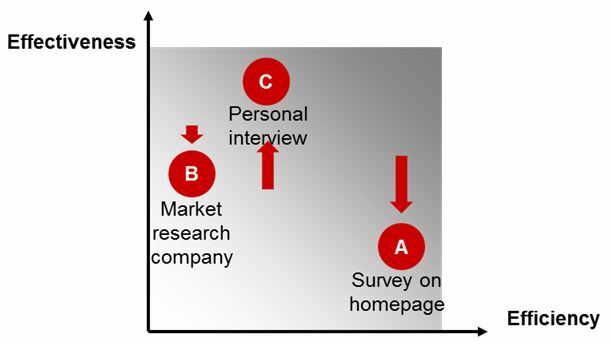 Personal interviews by sales reps will yield most detailed information and strengthen customer relationships as side effect. This options turns out to be most effective. In today’s competitive environment, it’s the businesses with the right set of tools and technologies that get ahead, while others are left in the dust. Business Efficiency For Dummies provides you with practical, useful information on how to run a more effective business while saving time and money in the process.